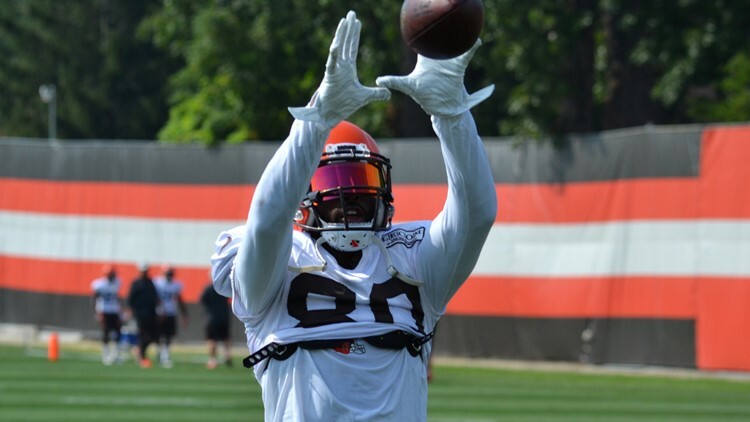 Cleveland Browns wide receiver Jarvis Landry squares up to make a catch during a drill on the final day of practice in front of fans at training camp in Berea. 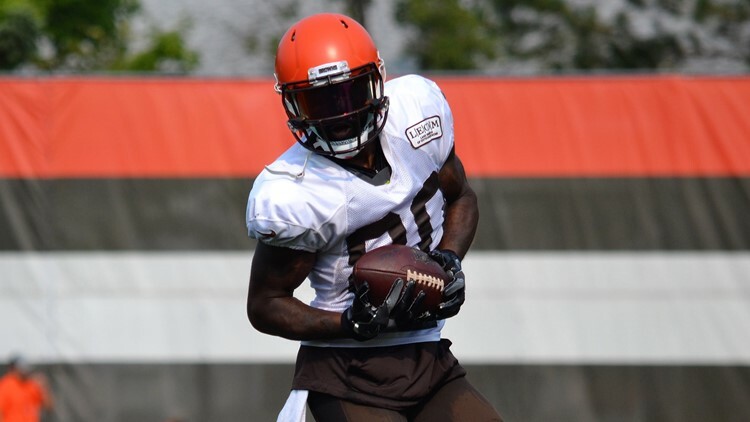 Offensive coordinator Todd Haley implored wide receiver Jarvis Landry to be an example for the Cleveland Browns on the penultimate episode of "Hard Knocks: Training Camp with the Cleveland Browns." 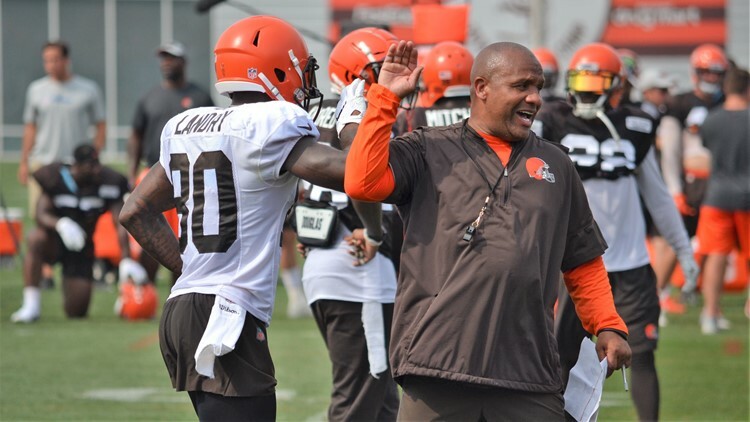 CLEVELAND -- Throughout the first three episodes of “Hard Knocks: Training Camp with the Cleveland Browns,” veteran wide receiver Jarvis Landry showed leadership and a willingness to set an example for his teammates. On the fourth installment of the five-part miniseries produced by HBO Sports and NFL Films, Landry was implored again to set an important example for the wide receivers after the third game of the preseason, a 5-0 win over the Philadelphia Eagles at FirstEnergy Stadium last Thursday night. “Man, we’ve got to get this going and you’ve got to be at the forefront,” offensive coordinator Todd Haley told Landry late in the game. “I’m going to keep saying it. It doesn’t matter. I’m not waiting for some -- what do they call it -- knight in shining armor? Cleveland Browns wide receiver Jarvis Landry stretches to make a catch during Monday's practice at team headquarters in Berea. Haley apologized to Landry for ripping into him twice earlier in the game. The Browns had four plays from Philadelphia’s one-yard line, but failed to get into the end zone on the drive. Two of the first three passes were toward Landry on a corner route, but he could not break through coverage and attempt to make a catch. Cleveland Browns wide receiver Jarvis Landry hustles up the field after making a catch in a drill during Sunday's practice at the Berea training facility. Haley took the opportunity to remind Landry not to wait for the officials to help him out with calls. When Landry explained that it was not the safety, but rather, the cornerback who was holding, Haley had a simple piece of advice. “Run through him,” Haley said. 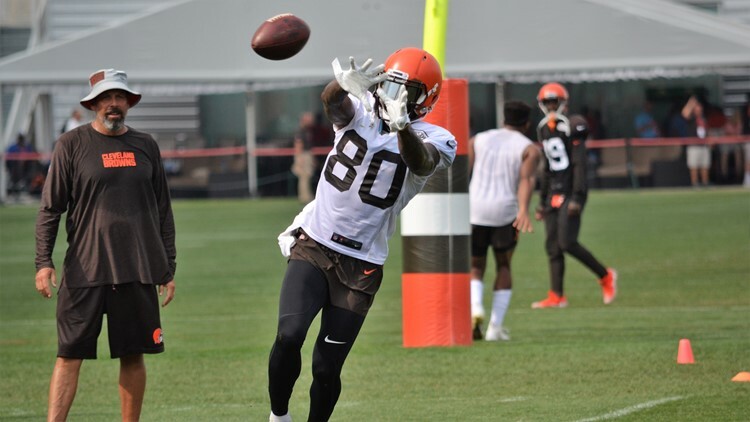 Cleveland Browns coach Hue Jackson and wide receiver Jarvis Landry (80) celebrate the latter's one-handed catch during a drill on the final day of practice in front of fans at training camp in Berea. Later in the game, Landry was the target of a pass down the left sideline, but Tyrod Taylor’s throw sailed toward, and eventually, into the Browns’ bench area. That play led to an expletive-laden exchange between Haley and Landry. With the team breaking camp ahead of their Week 3 preseason game, the first-year players took part in the Rookie Talent Show, and one thing is for sure, quarterback Baker Mayfield does not lack for confidence, as he gave an impersonation of Browns general manager John Dorsey. Almost everybody liked Mayfield’s impersonation. “I got a chance to watch you at Oklahoma a little bit, and then, studied you going into the draft, and I mean what you did in your collegiate career, but what I like is that you just want to win,” Hall of Fame quarterback Troy Aikman told Mayfield. While Aikman was a fan, Dorsey was not. “He hated it,” Mayfield said. Cleveland Browns quarterback Tyrod Taylor (5) holds his hand after being injured during the first quarter of a preseason against the Philadelphia Eagles at FirstEnergy Stadium in Cleveland. On fourth-and-goal from Philadelphia’s one-yard line, quarterback Tyrod Taylor scrambled out of the pocket and toward the left side of the formation, and as soon as he let go of the ball, his left hand buckled underneath him on the way to the turf. 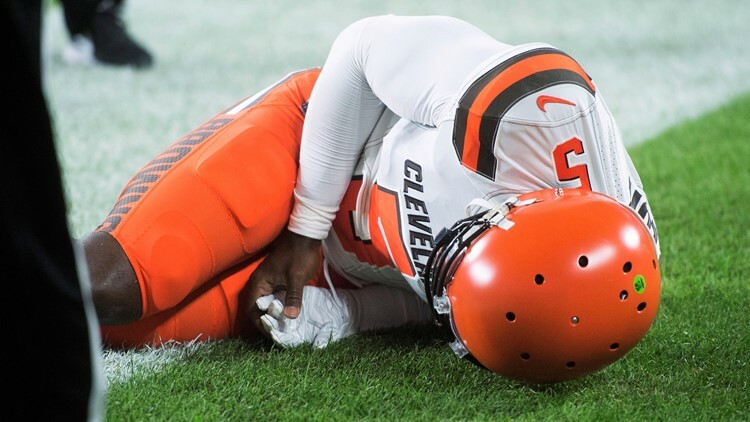 With Taylor writhing in pain on the ground, members of the offensive line immediately waved to the Cleveland sideline for medical assistance, but before the training staff could get to the opposite sideline, the eighth-year quarterback hustled his way over the Browns’ bench while keeping his left arm still and braced against his body. 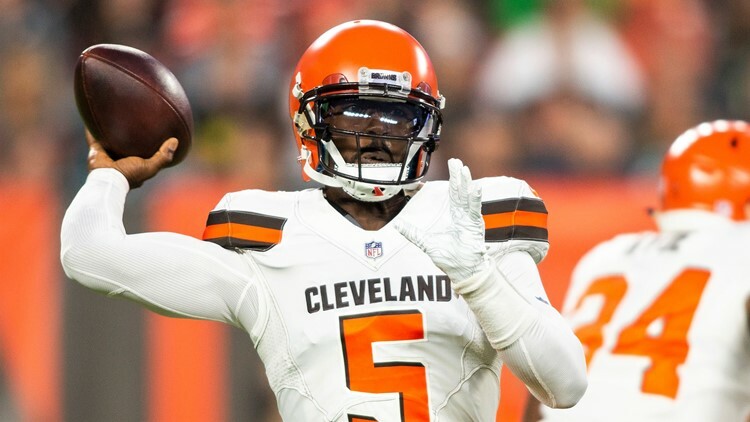 Cleveland Browns quarterback Tyrod Taylor (5) completes a pass during the first quarter of a preseason game against the Philadelphia Eagles at FirstEnergy Stadium in Cleveland. Taylor suffered a dislocated left pinkie finger, but when the medical examinations revealed no further damage, he went back into the game and finished the half.